The following is a list of The Crow official licensed merchandise, sold through Kitchen Sink Press. 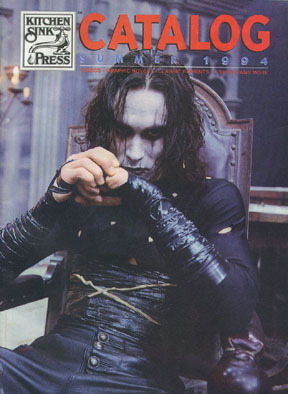 The first 27 items were first offered for sale in June 1994 via a special 8-page Crow merchandise catalog. In the spring of 1995, KSP sent out a 1-page double-sided mailer to its Crow Club members. This "special offers" list featured 9 new Crow collectibles, some exclusive for members. Many of the items offered were in advance of availability in retail stores. 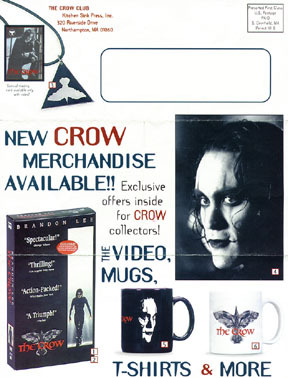 Finally, in 1996 another flyer was sent out promoting merchandise for The Crow: City of Angels movie, and featuring 4 new Brandon Lee Crow posters. All of these items are now long out of print and most are fairly difficult to find. 27. 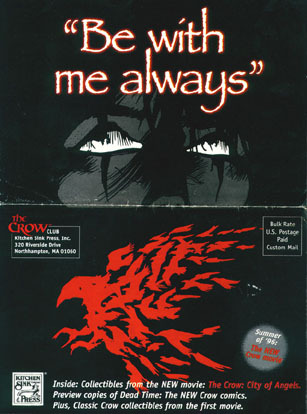 * The Crow soundtrack (CD & cassette. *In a re-pressing of the catalog, this item replaced the trading card uncut sheet). In addition to the 4 new posters, this flyer also offered previous catalog items that were still in inventory - the pendant, both coffee mugs, the serigraph, The Crow movie book, The Crow book, knit cap, ski cap, signed videotape, the silver rings, door poster and the Crow sticker No. 2. 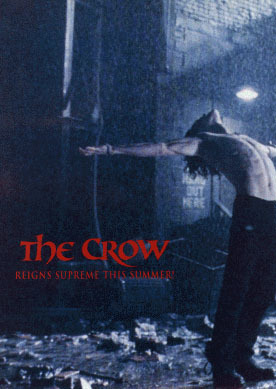 Five Kitchen Sink Press publications offering The Crow merchandise. From left, 70-page Summer 1994 catalog, 8-page 1998 Official Crow movie merchandise catalog, 1-page double-sided 1995 Crow Club flyer, 4-page 1996 Crow Club flyer, and unknown catalog. All of the merchandise has long been sold out. Click on any image to enlarge.